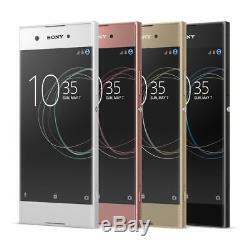 Sony Xperia XA1 5.0 IPS LCD Octa Core SIM Free Unlocked Android 32GB Smartphone. Best-in-class camera in an elegant, borderless design. The Sony Xperia XA1 boasts a 23MP camera with Exmor RST for mobile sensor and F2.0 lens, meaning you can take great pictures even in challenging conditions. The camera launches in less than a second and with incredibly fast and accurate autofocus, even the most spontaneous moments are free from blur. On the flip side, the Xperia XA1's 8MP front selfie camera has a 23mm wide-angle lens that lets you fit lots of friends into the picture. The hand shutter automatically detects the palm of your hand and takes your selfie. Borderless design that fits in your hand. The Xperia XA1 has a smooth, rounded form and a full-width 5 display, that leaves the frame barely visible and sits comfortably in your hand. With a power-efficient processor, you get a quicker and smoother user experience, whether you browse the web, watch a video or play your favourite game. The Smart Cleaner feature automatically deactivates the apps you don't use and clears the cache, to optimise storage and memory. You can also add up to 256GB of additional memory with a Micro SD card. Qnovo Adaptive Charging monitors battery conditions like temperature and pressure, then adjusts charging currents to maximize the lifespan of your Xperia. The Xperia XA1 learns and adapts based on how you use it, getting smarter and more personal every day. By automatically adapting the settings to the environment you're in, Xperia XA1 simplifies your everyday life. Dimensions (H x W x D mm): 145 x 67 x 8. Display: 5.0 IPS LCD HD capacitive touchscreen. Processor: MediaTek Helio P20 Octa Core 64bit. OS: Android 7.0 (Nougat). Connectivity: Wi-Fi, NFC, Bluetooth 4.2. Camera: 23MP main with LED flash, 8MP front facing. Please read these Terms and Conditions carefully before using this site. (our site), whether as a guest or a registered user. When using our site, you must comply with this Acceptable Use Policy. Terms and conditions of supply. Will apply to the sales. Is a site operated by Brightstar 20:20 UK Limited ("We"). We are registered in England and Wales under company 08401611 and we have our registered office at Weston Road, Crewe, Cheshire, CW1 6BU. Our VAT number is 824296518. We are a limited company. Access to our site is permitted on a temporary basis. We may suspend, withdraw, discontinue or change all or any part of our site without notice. We will not be liable to you if for any reason our site is unavailable at any time or for any period. If you choose to access our site from outside the United Kingdom, you do so at your own risk. If you choose, or you are provided with, a user identification code, password or any other piece of information as part of our security procedures, you must treat such information as confidential. All such rights are reserved. You may print off one copy, and may download extracts, of any page(s) from our site for your personal use and you may draw the attention of others within your organisation to content posted on our site. You must not modify the paper or digital copies of any materials you have printed off or downloaded in any way, and you must not use any illustrations, photographs, video or audio sequences or any graphics separately from any accompanying text. Our status (and that of any identified contributors) as the authors of content on our site must always be acknowledged. You must not use any part of the content on our site for commercial purposes without obtaining a licence to do so from us or our licensors. Use of, or inability to use, our site; or. Use of or reliance on any content displayed on our site. If you are a business user, please note that in particular, we will not be liable for. Loss of profits, sales, business, or revenue. Loss of business opportunity, goodwill or reputation; or. Any indirect or consequential loss or damage. If you are a consumer user, please note that we only provide our site for domestic and private use. You agree not to use our site for any commercial or business purposes, and we have no liability to you for any loss of profit, loss of business, business interruption, or loss of business opportunity. We will not be liable for any loss or damage caused by a virus, distributed denial-of-service attack, or other technologically harmful material that may infect your computer equipment, computer programs, data or other proprietary material due to your use of our site or to your downloading of any content on it, or on any website linked to it. We assume no responsibility for the content of websites linked on our site. Such links should not be interpreted as endorsement by us of those linked websites. We will not be liable for any loss or damage that may arise from your use of them. Different limitations and exclusions of liability will apply to liability arising as a result of the supply of any goods by use to you, which will be set out in our. Uploading content to our site. Whenever you make use of a feature that allows you to upload content to our site, or to make contact with other users of our site, you must comply with the content standards set out in our. Any content you upload to our site will be considered non-confidential and non-proprietary. You retain all of your ownership rights in your content, but you are required to grant us and other users of the Site a limited licence to use, store and copy that content and to distribute and make it available to third parties. The rights you license to us are described in the next paragraph (Rights you licence). We also have the right to disclose your identity to any third party who is claiming that any content posted or uploaded by you to our site constitutes a violation of their intellectual property rights, or of their right to privacy. We will not be responsible, or liable to any third party, for the content or accuracy of any content posted by you or any other user of our site. We have the right to remove any posting you make on our site if, in our opinion, your post does not comply with the content standards set out in our. The views expressed by other users on our site do not represent our views or values. You are solely responsible for securing and backing up your content. When you upload or post content to our site, you grant the following licenses. You grant to us a perpetual, worldwide, non-exclusive, royalty-free, transferable licence to use, reproduce, distribute, prepare derivative works of, display, and perform that user generated content in connection with the service provided by the our site and across different media and in connection with the promotion of our site and services. In addition, you grant to us a right to sublicence third parties (for example, other users, partners or advertisers) to use the content for their purposes or in accordance with the functionality of our or their site. We do not guarantee that our site will be secure or free from bugs or viruses. You are responsible for configuring your information technology, computer programmes and platform in order to access our site. You should use your own virus protection software. You must not misuse our site by knowingly introducing viruses, trojans, worms, logic bombs or other material which is malicious or technologically harmful. You must not attempt to gain unauthorised access to our site, the server on which our site is stored or any server, computer or database connected to our site. You must not attack our site via a denial-of-service attack or a distributed denial-of service attack. By breaching this provision, you would commit a criminal offence under the Computer Misuse Act 1990. We will report any such breach to the relevant law enforcement authorities and we will co-operate with those authorities by disclosing your identity to them. In the event of such a breach, your right to use our site will cease immediately. You may link to our home page, provided you do so in a way that is fair and legal and does not damage our reputation or take advantage of it. You must not establish a link in such a way as to suggest any form of association, approval or endorsement on our part where none exists. We both agree to the exclusive jurisdiction of the courts of England and Wales. Thank you for visiting our site. How to return an item. Please note that you are liable for the cost of returning products to us unless the product is faulty, and you are liable for the product until it is received by us. Your rights to return products. You have the right to cancel your online order at any time before we dispatch the goods to you. The Regulations require us to provide you with goods in compliance with the sales of goods act and allow you to cancel without giving any reason e. If your product is not wanted within 28 days following the date of receipt of the goods. Pre-recorded and recording media, opened and used SIM cards once unsealed. If you have received your order and no longer want one or all of your products, please return your product(s) within 28 days from the date of receipt. Can I use the product before I return it? You may examine the products as you would in a shop. You can turn the product on and try it out. Please do not add data to the product until you are happy with it. Your products must be in a resalable condition. If you are returning the product because it is faulty please see Faulty/Damaged Items below. At times we may also contact you to offer an alternative replacement. Your statutory rights are not affected. When a promotional offer or discount - such as a 10% off voucher or 3 for 2 applies to more than one product, the total value of the promotional offer or discount is split and shared across each product in the correct ratio. Everything you could possibly need from the world of mobile phones and accessories with a guarantee of quality and all at competitive and discounted prices. We have long established and trusted relationships with most of the leading manufacturers to supply their official products throughout the UK and beyond. Foniacs are based in Cheshire in the north west of England and have over 20 years of experience operating in the Mobile Telecommunications industry from this site, successfully supplying products and services throughout the UK and across the globe. Our extensive warehouse logistics have always been, and continue to be, at the forefront of stock management and distribution in this highly competitive marketplace. For all of your pre and post sales needs, we have a comprehensive customer service department. Operating from offices adjacent to our warehouse, all of our staff are exceptionally well-trained to offer friendly and trusted advice in relation to our products and your order. The item "Sony Xperia XA1 5.0 IPS LCD Octa Core SIM Free Unlocked Android 32GB Smartphone" is in sale since Friday, September 1, 2017. This item is in the category "Mobile Phones & Communication\Mobile & Smart Phones". The seller is "foniacs_uk" and is located in United Kingdom. This item can be shipped to United Kingdom.